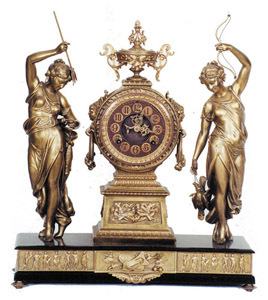 Ansonia Clock Co. figural clock, "Fisher and Hunter", ca 1894. One of Ansonia\'s finest arrangements. Almost perfect enameled iron base with bronzed frieze of Roman soldiers across the base. Side ornaments on the clock tower are ladies busts. Metal dial has bronzed numerals. The clock was restored by Bruce Baziluk to a golden bronze-verde finish. 8 day, half hour gong strike. Complete and original case is 19 inches wide and 22 inches high. Ly-Ansonia No.467.